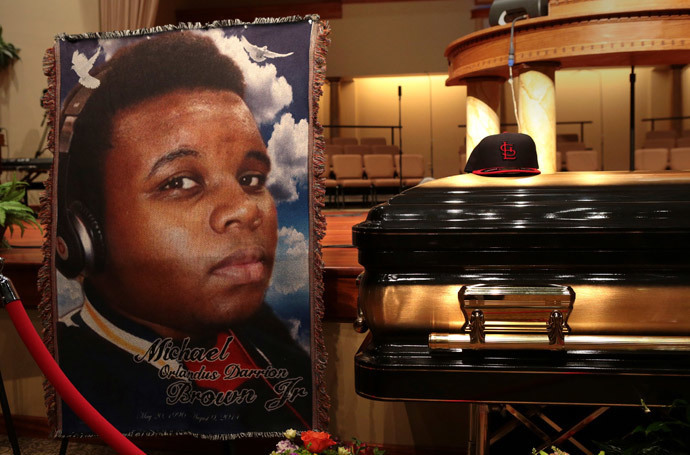 Darren Wilson, the Ferguson, Missouri police officer who gunned down unarmed teenager Michael Brown, testified Wednesday before a grand jury investigating the Aug. 9 shooting, according to a new report. An unnamed source familiar with the investigation told the St. Louis Post-Dispatch that a “cooperative” Wilson testified for four hours. No more details were offered. A spokesperson for the prosecution would not comment on witnesses who have testified before the grand jury. St. Louis County Prosecuting Attorney Robert P. McCulloch ordered that an audio recording of the proceedings, as well as transcripts, be made available to the public as long as there is no indictment in the case, McCulloch told the Post-Dispatch. 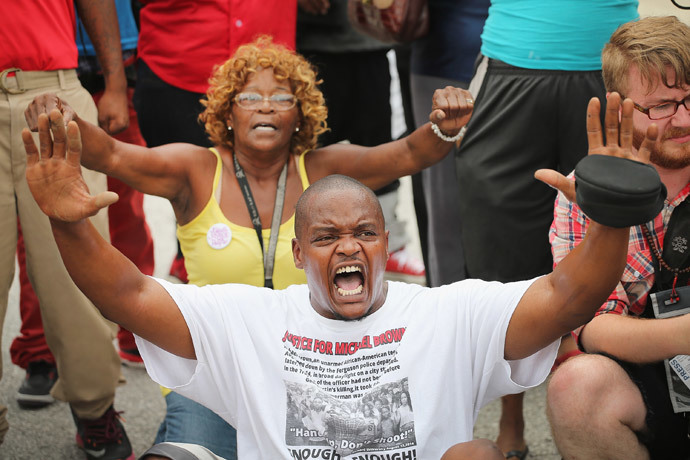 On Tuesday, St. Louis County Judge Carolyn Whittington granted an extension to the grand jury. The jury now has until January 7 to decide on an indictment. The grand jury is to decide if the incident meets the standard for probable cause, based on testimony and evidence. The jury will continue to meet in secret as it decides whether to charge Ferguson police officer Darren Wilson, who is white, in the death of Brown, a black teenager. Wilson shot Brown at least six times from the front, according to the medical examiner. His body was reportedly left in the street for four and a half hours. There are conflicting eyewitness reports from residents and police, but several witnesses have described Brown as holding up his arms in surrender during the confrontation. That detail developed into the chant “Hands Up, Don’t Shoot” during several weeks of ongoing protests that followed the incident. St. Louis County Director Paul Fox has said there are three African-Americans on the 12-member Missouri jury (one male and two females), along with nine whites (six males and three females). Brown’s killing set off weeks of civil unrest in the suburb of St. Louis, which has a majority-black population while its police department and city leadership is predominantly white. 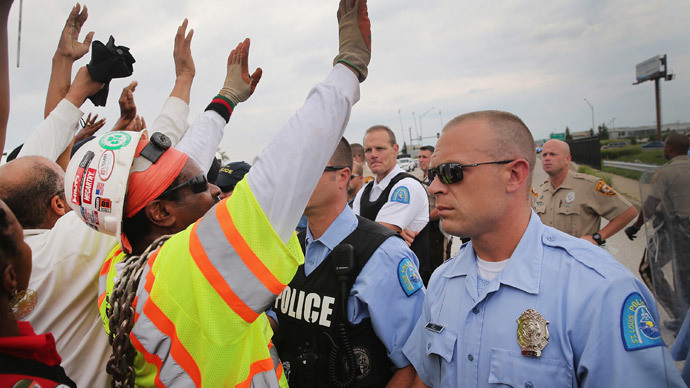 Law enforcement’s militarized response to protests and demonstrations near the site of the shooting exacerbated tensions and galvanized a local population calling attention to racial grievances. “How many people have to say his hands were up in the air?” shouted one speaker at the meeting, according to KPLR. Attendees also again called for McCulloch, the county prosecutor, to step down from the case. He is seen as having a close relationship with the Ferguson Police Department. McCulloch’s father was a police officer killed in the line of duty when McCulloch was a child, and he has relatives currently working in law enforcement. McCulloch could have filed charges against Wilson himself, but chose to send the case through a grand jury.